Everything you need to know for powerful workplace and public policy. Like most in the U.S., many Louisiana’s families take unpaid leave and face financial hardship because of it. 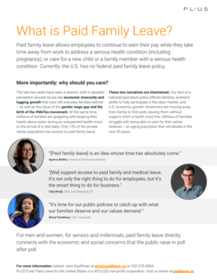 The state’s voters are coming together around their support for paid family leave legislation and candidates who champion the policy. 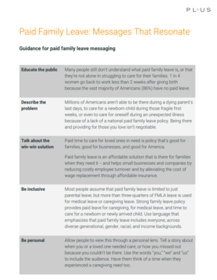 Paid family leave policies help businesses recruit and retain the best talent. We don't just run campaigns—research and analysis is central to what we do at PL+US. 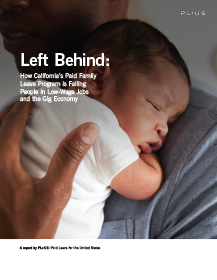 The cracks in California’s existing paid family leave program leave many of the state’s low-wage residents, government employees, and people working in the gig economy to fend for themselves. A new standard for paid leave has emerged, and it includes hourly workers, fathers, and more time to care. Workplaces across this country are transforming—and its time for all family-friendly brands to put families first. 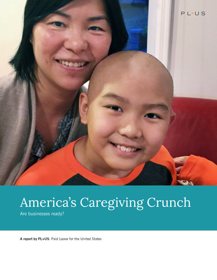 America's Caregiving Crunch: Are Businesses Ready? Our research shows that companies are unprepared for the silver tsunami—nearly every single employer we surveyed has no offering of paid family caregiving time to meet this demand. 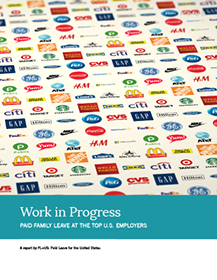 An in-depth look at the paid family leave policies of the largest employers in the United States reveals a stark picture of exactly who is being left out: dads and adoptive parents. Unequal paid family leave policies at the nation's largest retail employers hits low-income and households of color the hardest. 114 million Americans have no paid family leave. Corporate America can be part of the solution.